If you have ever visited a ski resort, you may be familiar with snow cannons. But this isn't just your bog-standard snow cannon. 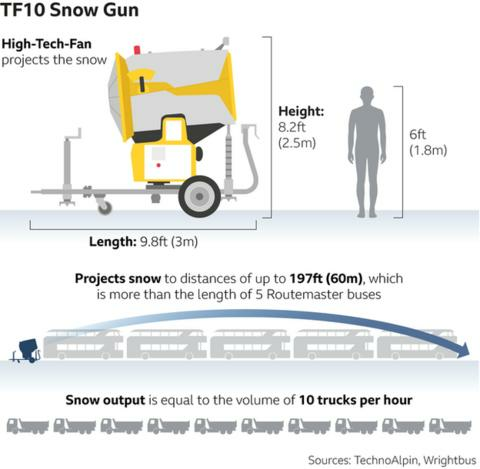 This is the TF 10 Snow Gun. The Arnold Schwarzenegger of snow cannons, if you will. The TF10s are being used at the Winter Olympics in Pyeongchang to create extra snow on the courses where needed. With snow falling on only seven days on average in February, and an average fall of just 6.3cm, they need all the help they can get. Organisers have spent £4.4m on 250 snow guns and over 80% of the snow-based events will take place on artificially created snow. The manufacturers claim these are the most powerful snow guns on the snowmaking market and can project snow up to 60 metres. Another nifty little feature is that they are Bluetooth so can be controlled remotely when placed on a high tower.